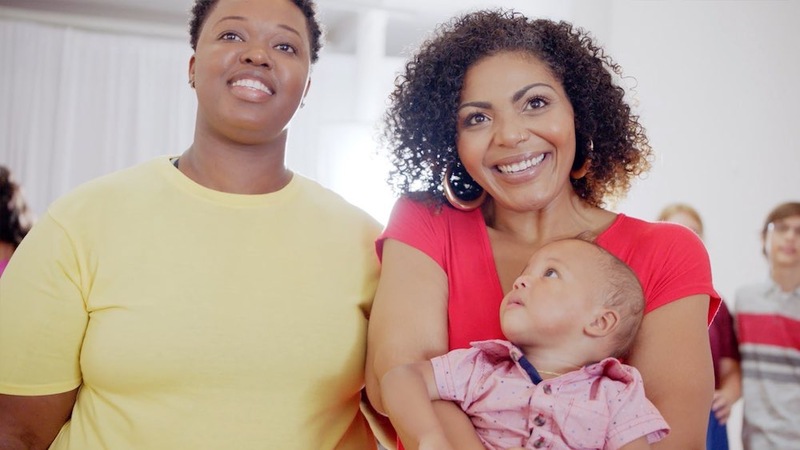 As part of their #ReinventMindsets campaign, Free The Bid-pledged brand HP and agency Edelman teamed up with experiential and interactive director Annie Saunders at HELO, creating a one-of-a-kind social experiment to showcase the true diversity of the American family. Participants initially revealed their ideas of what the “all-American family” looks like – despite differing experiences of their own, many described remarkably similar visions. Then, with Annie providing instructions, the participants were asked to organize a room full of people into groups that, in their minds, would best exemplify these ideas of the quintessential American family. The twist? All of the people present were actually part of real families, representative of a full spectrum of diverse family structures & dynamics. When the real families came together, the experiment’s participants were shocked (and pleased) to see the results. The project served to underline the fact that real life contains far more possibilities than those we’ve seen represented in media for decades, and furthers HP’s deep commitment to diversity on and off screen. We spoke to Annie about how her previous immersive theatre experience prepared her to handle the unique directorial challenges of this shoot, working hard to “carefully curate the vibe” on set, and how she’s managed to create a singular career path by embracing all of life’s weird detours. How were you first brought in to work on this project, which is as much a social experiment as it is an ad campaign? This campaign spoke to me on a number of levels: it was creating a live experience for real people in real time, working with non-performers, and addressing sensitive social and personal issues in a structured space and in front of a camera. All of these aspects interested me and spoke to my experience as a director and creator of experiential live art. HELO put me forward for the project, as it required a sensitivity to live experience and visual storytelling, as well as “a lot of empathy and humanity” (as Brendan Kiernan, HELO’s MD, put it). I was really excited to be the director chosen for this work. What were some of the highlights of working with pledged brand HP, whose marketing has had such a dramatic increase in the number of women hired for its campaign films since the implementation of the Free The Bid pledge? I had a fantastic experience working with HP. They were so on board with my vision for how the day would run, which was a real leap for a brand. We brought in 45 real people and created an incredibly intimate space for exploration and vulnerability in a very short space of time. In order to do that, I brought in colleagues who create intimate live performance and experimental, improvisational work with large groups: movement director Jessica Williams and interdisciplinary artist Anna Maria Nabirye, who is also my co-lead artist on Up In Arms. This was a set populated with intergenerational real families, really opening up with their stories, being facilitated, created and directed simultaneously by three experimental performing artists in real time. It was a big out-of-comfort-zone step for a brand, and HP took that step boldly, with enormous faith in my vision. They were brilliant! Reportedly, they all cried whilst watching the monitors on the day, which was very moving. 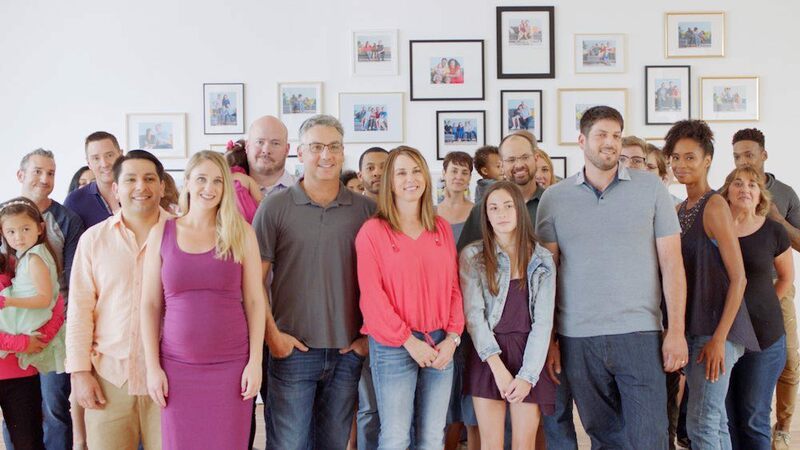 How did the casting team assemble a group that so beautifully exemplifies the true diversity of American families? 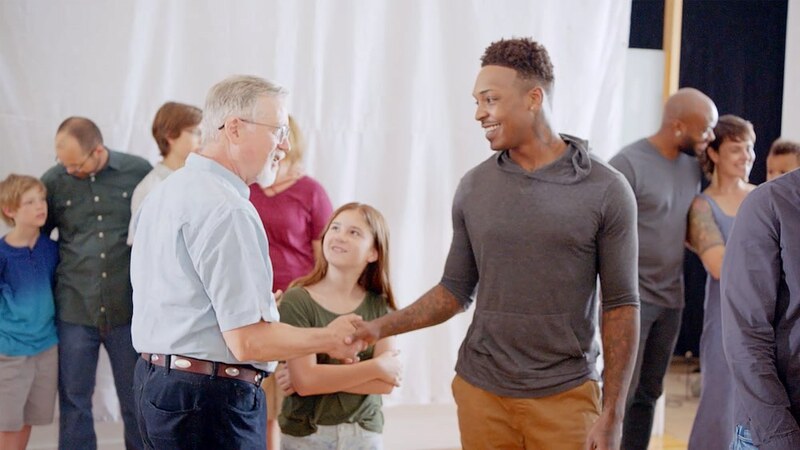 The casting began before I even came on board, although I did work a bit with the casting team on the questions they posed to the families and individuals in their response videos. I was blown away by the participant submissions. 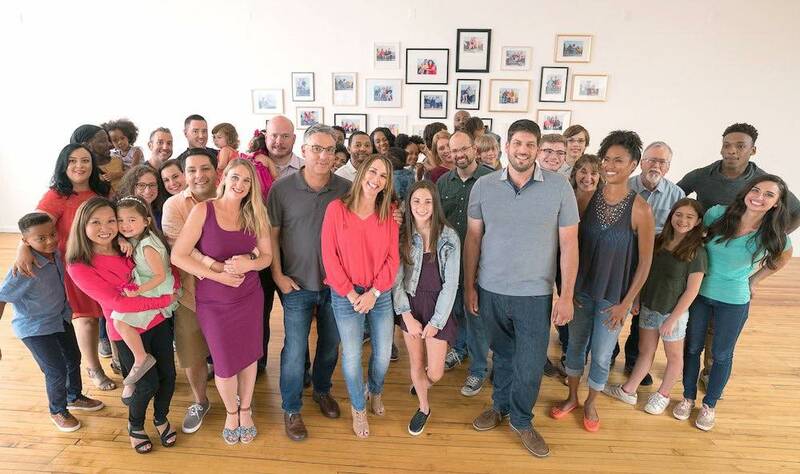 JSM Casting in Chicago did an incredible job; they were so considerate, sensitive and intuitive with the call out. Questions such as “what does family mean to you?” were posed, and the participants sent in multiple self-tapes. We fell madly in love with all of them. What was the mood like on the day? What was the structure of the shoot day like, from your perspective as director? It was a really moving day. Multiple times throughout the day people mentioned what a special set it was. As I mentioned, all the client and agency folks were moved to tears, which is certainly a new threshold of success! I had an amazing team of women with me: Anna Maria Nabirye was there as a creative working with the participants, Jess Williams worked with the families to create this incredibly poetic movement sequence they used to reveal who they belonged to, and Rebecca Straney from HELO – who has worked with me on multiple live experiences and understands my process completely – was there every step of the way. It was a beautiful, supported experience. At the start of the day I made a little speech to all the crew to say that we are basically hosting a party for 45 people of all different ages and backgrounds here today, and our energy matters so much, and let’s just all be human beings. (Apparently, I actually said, “let’s just all be human beings” which I think is hilarious but also totally characteristic of my process). As a maker of site-specific work where the audience has free agency to move through the space, the energy we bring as energetic guides of spaces into which we invite others is so important. On a shoot like this, it determines everything. In order to create a space where people can quickly feel held enough to truly open up, we have to carefully curate the vibe, there’s no other way to put it! Otherwise, people sense it and their defenses are up right away. We all are intuitive, visceral beings. We know where it is safe and where it isn’t. 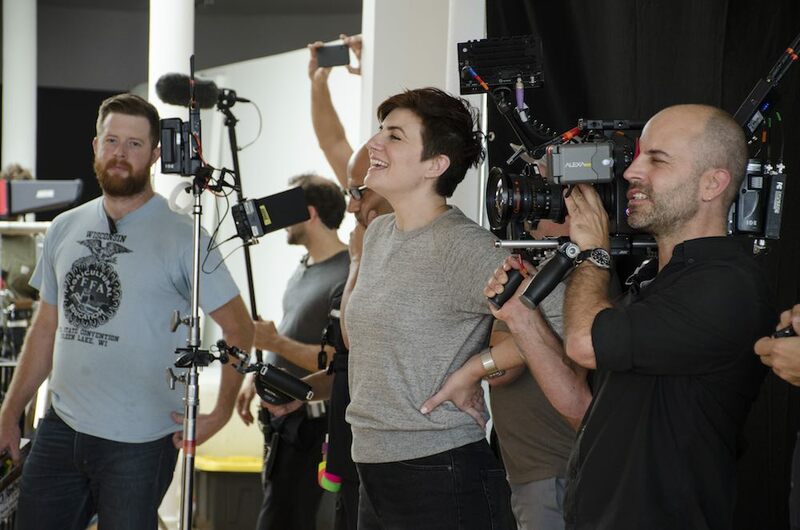 To do that on a set – with all its bright lights, time tensions, airlessness and heightened sense of urgency – is a big effort and everyone had to align on keeping the feeling buoyant on the day. This shoot posed a fairly unique directorial challenge: you are actually featured on camera directing the group of participants! How did you approach the dual role of directing the action both in front of and behind the lens? Actually, moderating the experience myself was the only logical choice for me going into making this piece! I knew that I needed to lead the day and be the first person in front of the participants in order to facilitate their experience and their journey effectively. I also had my amazing team, and Anna Maria and Jess, guiding the participants in different parts of the space: while I was doing interviews, Jess was creating choreography and Anna Maria was working with kids printing photographs for the gallery. It was brilliant to see the client and agency respond to a set running like that – collaboratively, creatively, with real tend-and-befriend feminist culture. Did this experiment yield different results than intended? What were some of the surprises for both you, the team, and the cast? I think the participants were all surprised for different reasons, which was really lovely to watch in the reveal. One guy who was raised in a strong maternal lineage had never seen a single father household before, and was really blown away by that. Another woman picked out a group of people as a family who, at first, she said just looked great together. However, then she reflected that maybe she felt that ‘family’ would never be questioned by passersby as to why they were together and who they were to one another, which she told me is something that happens often to her and her partner with their children. There were some moments of real exploration through experience, and of discovery about themselves and each other, which were beautiful to see. What are your favorite elements of this film’s message and the final work? What I hope comes across is the feeling of togetherness that was created for the participants on the day. You really never know what is going to happen with something like this! It’s unscripted and there are no performers. There’s nothing to invent, it’s all really happening. It’s just about how we can infuse the space with an atmosphere that makes magic possible, and I really think we accomplished that. There is a real feeling of intimacy, truth and humanity in the piece, and I think that accurately reflects what it felt like on the day. We managed to capture that. David McFarland, the DP, was absolutely unique and outstanding in his ability to catch the reality of each moment in a subtle and poetic way that never interfered with the emotional journey of the participants in the moment. You’re a director known for your experiential works – did this spot feel like a step in a different direction for you, or do you feel that you got to utilize some of the same skill-sets that you bring to experiential projects? This project definitely entailed an experience-creation for the participants. It felt like we were making a piece of interactive theatre for them, where myself and the crew were the performers, so to speak. That’s why I was so adamant about the crew maintaining a welcoming, friendly, dependable (‘welcome to our home, we’ve taken care of everything’) attitude! It was a day-long improvisational live performance for the crew, and the participants were the audience, that’s how I saw it. 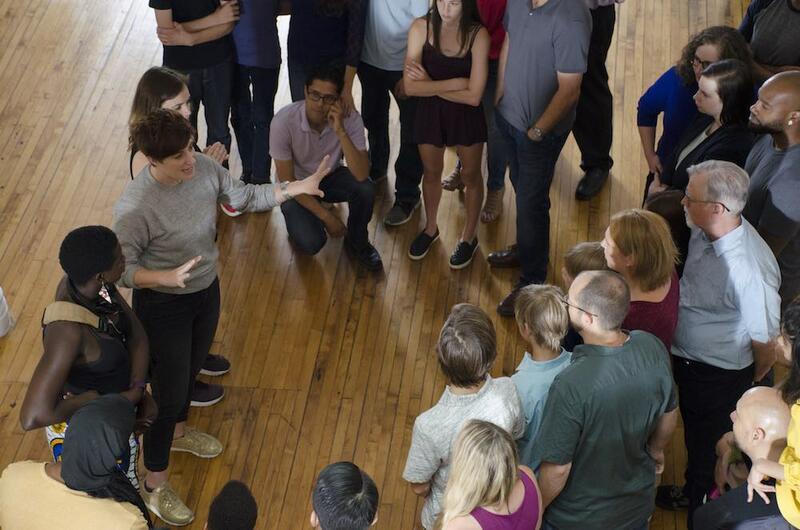 How did you find your way into creating immersive theater and experience-making? In a million roundabout ways, and also, I suppose, in the most natural of ways; I’ve always been on this path, I think. I trained as a performer, and then went to graduate school for literature and philosophy, and then started directing and producing my own work. Things that seem random – like working in production on a large-scale art installation or writing long-form research on critical theory, art, literature, or community organizing, putting on a bake sale – all of these worked toward what I am doing now. HELO reached out to me in 2015 and we started working together the following year on artistic endeavors and branded campaigns. They have shifted my career in a major way and ours is an incredibly exciting collaboration. It’s so great to feel part of a team and at home with a company in the way I do there. What are some of the past projects that you’ve done that best exemplify your vision as a creator? I think my vision is constantly shifting, but there are always recurring elements. I’m always interested in women’s stories, I’m always interested in agency for the audience, so they can move freely and see things as the choose. I’m always interested in found spaces, non-traditional spaces, and in creating experiences in real time in spaces that are vanishing. I’m more and more interested in sound and experimenting with sound as a medium. The Wreck, my recent opera project, and The Day Shall Declare It – which I created with Sophie Bortolussi and which HELO brought to LA in 2016 – both exemplify this, along with The Big Chase, which I created for ASICS with HELO in 2017, as a branded experience example. There’s so much going on! I’m just about to head to the MATTER conference in Marrakech, to give some workshops on creating meaningful experiences in the luxury travel industry. I have some really exciting brand projects coming up with HELO, both experiential and on-camera, including a multi-city site-specific project that will bring in a lot of new collaborators. I’ve just finished a run of an experimental theatre work with my company Wilderness at the Edinburgh Festival, and I’m working on a large-scale multi-platform project with immersive performance and interactive digital elements called The System. I’m also preparing to launch and tour Up In Arms, a live art, social practice and experiential/interactive media project I created with Anna Maria Nabirye, which was also supported by the team at HELO. Free The Bid is committed to diverse representation behind the camera in all production roles, which is equally as important as the onscreen diversity portrayed in this spot. What are some of the positive experiences that you’ve had in working with crews that are comprised of diverse members? The positive experiences abound! A crew of diverse individuals is really important to me on every project. In a nutshell, the benefit of having a multitude of voices on the creative and logistical side is that there are just fewer blind spots. Only if there are lot of different kinds of voices in the room can we go some distance to making work that speaks to more people, resonates with more people, alienates fewer people, and opens things up. We need those voices behind the camera and below the line, as well as represented on camera. I am always looking for crew members who are women of color, in particular – reach out if that’s you! What final words of advice would you like to give to women aspiring to follow in your career footsteps? It’s so encouraging that young women may be aspiring to follow in my career footsteps! I would say: you are already making your own footsteps. You are already on your way there, even if it doesn’t feel like it all the time, or most of the time. If you were walking in my actual past footsteps, you’d probably be thinking ‘hang on, how is this leading to where she is now?! This is a weird detour.’ Trust your path. The best advice I think I can give is just pay attention to what the things are that get your attention. Develop your taste. Strengthen the current that guides your own desires, your own instinct and intuition. The most important things to discover are: 1) what holds your attention, 2) what excites you, and 3) what gives you a feeling of peace. Find your voice and get it as clear as you can. Make stuff with your friends. Fool around. Spend your time developing a strong voice for yourself and an engaged and loving relationship with who you are. Spend time on raising and reflecting your estimation of your own worth by listening to yourself. Be interested and curious. Play and pay attention. It’s you in there! You’re the only one in there. Make it a nice place to be.